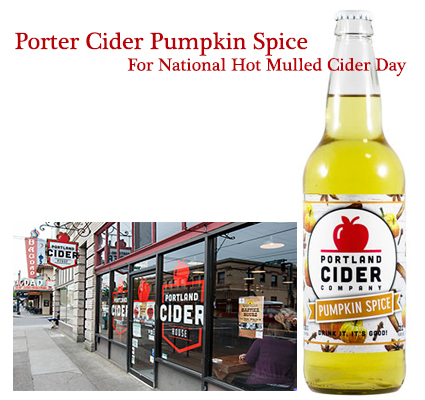 Portland Cider Pumpkin Spice For National Hot Mulled Cider Day! Today is an outstanding time of the year to enjoy hot mulled cider. However, for those who appreciate their cider served cold and with a kick, we recommend the Porter Cider Pumpkin Spice (an award-winning treat). Yes! The Portland Cider Company began as an endeavor to sate the tastes of proprietor's Lynda and Jeff Parrish. She is from the Somerset county of England and he is from Oregon. He longed for the kind of cider from she was accustomed to. She longed for it as well. Their first cider was conceived in a guest room closet and literally grew from there. We were seriously glad to receive this seasonal (available from September through November) delight. We love pumpkin, to the point that an uncooked pumpkin pie is not safe in our home. Ye-ah. It's just like that. Hence, we victoriously popped the top and shared with another reviewer who ended up finishing the bottle. We selected this reviewer because of her love of cider. We call it, "Delicious!" We appreciated the side-by-side flavors of cider and pumpkin spice. You'll find your next bottle via this link.